WindScribe is one of the relative new VPN (virtual private network) service provider that allows users to connect one of its server and send and receive data over the Internet (public network) via secure and encrypted tunnel connection between the computer and the server, enhancing the privacy protection and restoring access to geographically blocked content. WindScribe describes itself as a set of tools that work together to block ad trackers and web beacons, restore access to blocked content and help you safeguard your privacy online. It comprised of 2 components: desktop VPN application and browser extension. The desktop VPN application is a Virtual Private Network (VPN) client which creates an encrypted tunnel from your computer to WindScribe servers, and all the Internet activity is sent through the tunnel. The browser extension provides a “Lite” VPN client, which does the same thing as the desktop one, but only in your browser, in addition to blocking thousands of ad beacons and trackers, various “social widgets”, such as Facebook Like buttons, Twitter badges, etc, and rotating user agent (which identifies your browser). WindScribe uses AES-256 cipher with SHA512 auth and a 4096-bit RSA key for encryption of VPN tunnel, ensuring no eavesdropping can occur on the Internet traffic. 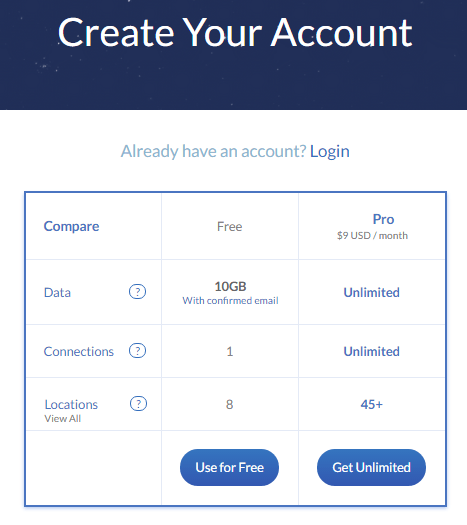 WindScribe does provide a free VPN plan with no cost for everyone. But free VPN plan has some restrictions and limited bandwidth – max 10 GB per month, 1 device only, no OpenVPN configs and 8 VPN server locations only. If you can live with the many restrictions, the main issue would be 10GB/month quota, which can be used up quickly especially you’re into P2P and movie streaming. But with the following little voucher code, you can increase the monthly free VPN bandwidth allowance to 50GB, an five-fold increase. Go to https://windscribe.com/signup and select Use for Free. On the registration form, enter thye Username, Password (twice) and Email. 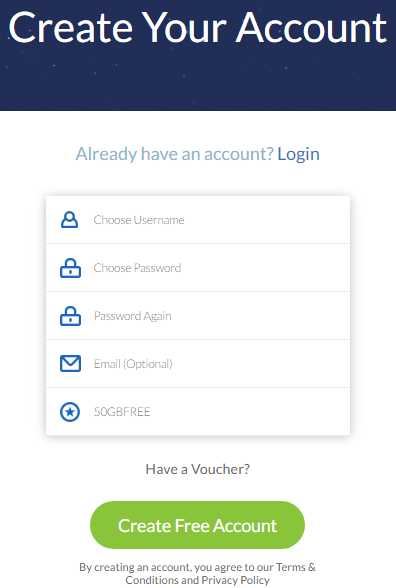 Click or tap on Have a Voucher?, and in the Voucher Code text field enter 50GBFREE to get 50GB/month bandwidth quota allowance instead of 10GB/month. Select Create Free Account when done. Check the inbox of the email address. You should receive an email from WindScribe with title of “Confirm your email address”. Click on the link inside the email to confirm the email address. Once the email address is confirmed, your Windscribe account is upgraded assigned with 50GB Free status. If you’re signed up for Windscribe account without entering a voucher code, you can login to Windscribe account dashboard, and select the Claim Voucher to enter 50GBFREE to earn the extra 40GB per month bandwidth. WindScribe provides apps for Windows, Mac, Linux (Ubuntu), Android, iPhone, Chrome, Firefox, DD-WRT, Tomate, ASUS, Synology NAS and more. The free account allows user to connect to VPN servers at US East, US Central, US West, United Kingdom, Canada East, Canada West, Hong Kong, France, Germany, Luxembourg, and Netherlands.